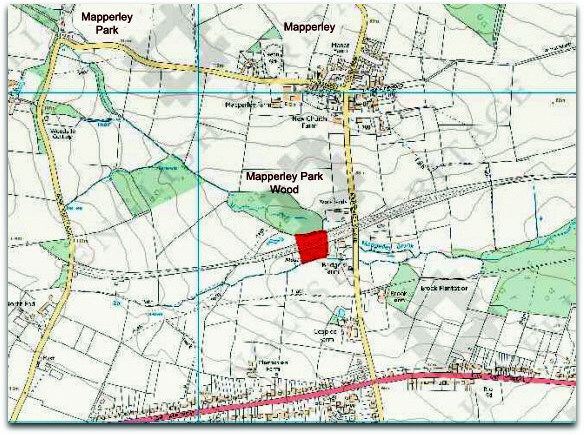 Mapperley is mentioned in the Domesday Book (1086). William the Conqueror, Duke of Normandy, King of England retained many of the Derbyshire Lordships and Manors, distributing his power. Villages were managed by bailiffs, stewards or men-at-arms who were at the Conquest. Motte and Bailey castles were built as look-out towers on many village boundaries to defend against intruders. This is the type constructed in Mapperley ParkWood, the moat still being visible, especially in early spring and autumn when the undergrowth is still low. Probably the most famous illustration of this type of castle is that shown on the Bayeux Tapestry. When the Midland Railway Company constructed the Mapperley Colliery Mineral Line in 1875, the castle was almost completely covered, leaving just the moat remaining on two sides. Although the footpath was diverted many years ago, the old stile leading to the site still remains and is accessible. Those not familiar with its location can find it off Mapperley Lane beside the old railway bridge. Take the footpath leading into the wood and proceed over the second stile. 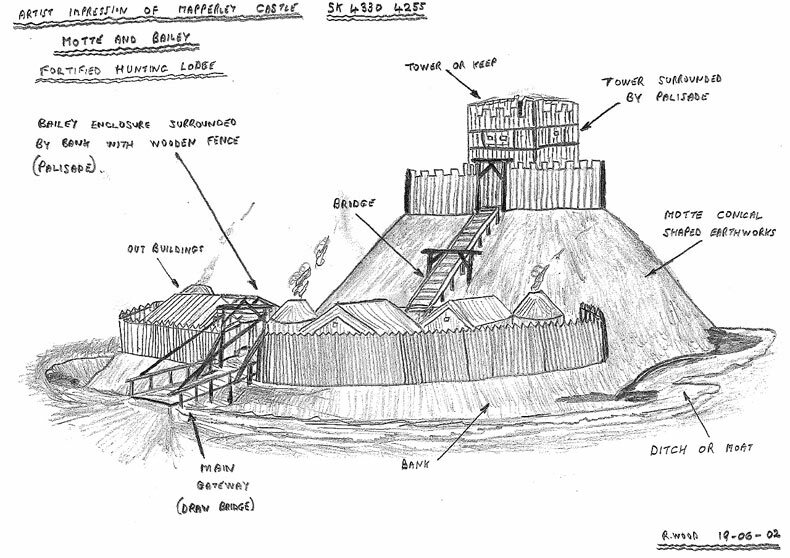 This type of castle consisted of the "Motte" a conical shaped earthwork and the "Bailey" an enclosure, surrounded by a bank with a wooden palisade (fence). A vee-shaped ditch was dug around the base of the sloping bank. Moats were often filled by diverting a nearby water course, water made climbing the sides of the bank difficult, if not impossible. These could be circular or rectangular in shape, Mapperley being the latter. The Motte supported the watch tower, which was always manned; another name for the tower was the Donjon (French for Lordship as its height dominated the surroundings). Prisoners were often locked in the donjon, this is how the word dungeon is derived. Rain water and waste water was diverted to run down the bank into the moat. A nearby drinking water supply was vital to the site and a well was sunk in Mapperley Park Wood and can be still seen today. Mapperley Park Wood – is to the right of the bridge on Mapperley Lane, part of ancient woodland where the ruins of a second moated manor house can be found. Once owned by Geoffrey Herdby and his wife Isabel in 1272. The railway embanked was built directly on top of the site. With very little being seen today, but parts of the original moat are still shown on ordnance survey maps. To many generations of locals in this location it has always been known as 'Mapperley Castle'. This name still indicated on the stile when entering the site. Once a favourite spot for family picnics. William the Conqueror, Duke of Normandy, King of England retained many of the Derbyshire Lordships and Manors distributing his power. Villages were managed by Baliffs, Stewards or Men-at-Arms who were at the conquest. William de Peverel held Mapperley in 1084 building a fortified hunting Tower in Mapperley Park Wood. The Tower was surrounded by a moat, parts of which can be observed today. Known locally as Mapperley Castle. Its location (SK4330 4255) is shown on ordnance survey maps today. With the old moat still recognised. The old stile leading to the site is still marked “Mapperley Castle”. A nearby water supply was vital to the site so a spring was diverted and a well sunk in Mapperley Park Wood, this is also shown on the 1880 ordnance survey. This monument is scheduled under the Ancient Monuments and Archaeological Areas Act 1979 as amended as it appears to the Secretary of State to be of national importance. Although up to half the moated site in Mapperley Park Wood is concealed beneath a railway embankment, it is a good example of a small homestead moat whose earthworks survive well and in which the buried remains of buildings and other structures will be well preserved beneath the embankment. The monument is a moated site comprising a roughly square platform surrounded by a 12m wide moat with an average depth of c.2m. The platform, half of which is buried beneath a railway embankment, is c.45m square and includes a bank around its visible edge which would have been the site of a wall or palisade. A substantial outer bank encloses the moat and incorporates a 15m wide breach on the south side corresponding with a former bridging point across the moat. The precise history of the site is unknown but documentary evidence indicates that it was inhabited in c.1330. The railway embankment and all modern fencing are excluded from the scheduling, although the ground underneath is included. During 1832 and 1833 Clay was removed from the wood and taken by horse and cart to the Blue-Fly fields in West Hallam, burning it into cinders. 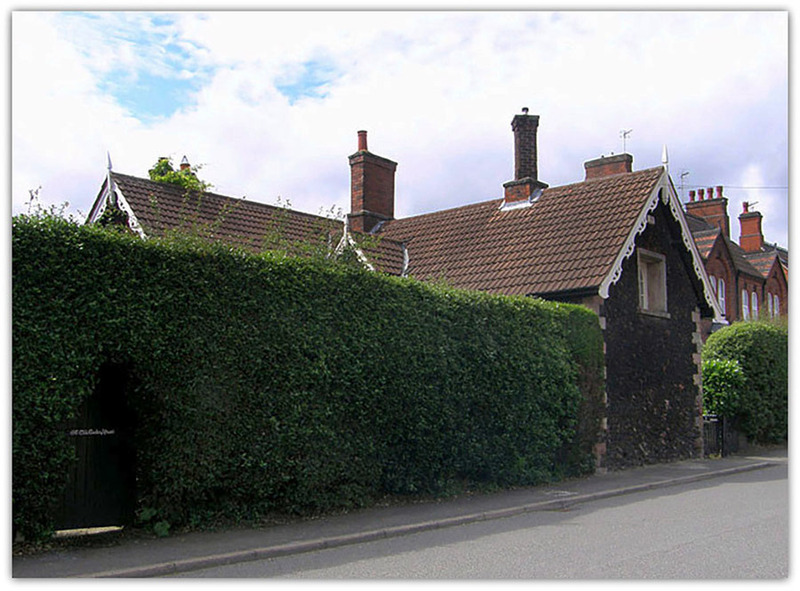 Used later to build the Cinder Houses on Station Road, West Hallam. The remainder of the clay was taken by horse and cart to Shipley Hill and a Folley or Ice House built. Old horse drawn tramway rails were also used in the construction to tie the cinders together. Parts of the building can be seen today. (Fenced off in a dangerous condition). In 1875 the Midland Railway Company built its branch line to Mapperley Colliery, completely covering the site apart from the outer edges of the Moat. During the early 1900’s this was a popular picnic area for residents of the village, the isolated meadow being full of Spring flowers. By 1945 parts of the surrounding area had become the village ash and rubbish tip. With the ground alongside Hallam Brook being partially filled in. Mound from the tip can still be seen. Amber Valley Borough Council has 12 scheduled Ancient Monuments. 1). Moated Hunting Lodge and Well. (Mapperley Park Wood).(Ref. SM23305). 2). Park Hall Moated Dwelling. (Ref. SM23294).